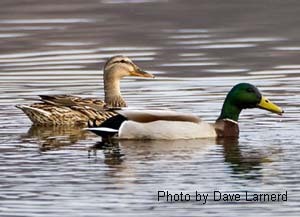 Probably the most common and recognizable of all the ducks is the mallard, which can be seen year round in New York. 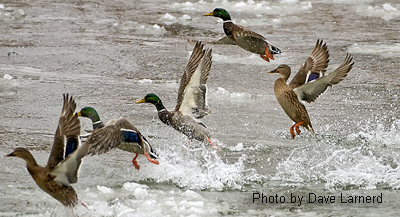 When we think of mallards we think of the classic metalic green head and yellow bill of the male (drake). He also has a chestnut brown breast and a thin white necklace. The female is a less colorful mottled brown speckled with a spattering of black with an orange color bill. Both male and females have a blue speculum (wing patch) bordered with white on each wing. Almost everyone is familiar with the stereotypical duck “quack”, characteristic of the mallard. This popular bird is so recognizable that if you were to ask someone to name a type of duck it would be the first to come to mind. Ducks are omnivorous birds and eat a wide range of different foods. The Mallard belongs to the group of ducks called “dabblers" which commonly feed by tipping head down and tail up for shallow underwater plant life, seeds, small amphibians ( frogs, tadpoles ), invertebrates ( snails ). They sometimes can be seen feeding in parks and on farm lands. Nesting season is sometime around the month of April and you will find the female mallard searching for an appropriate nesting site. Their preferred location would be within a hundred yards of a source of water. Unlike a lot of other birds they usually do not build a nest from scratch, but rather look for a ready made depression of grasses or soft reeds. It is not uncommon however to find a nest in a backyard planter box if there is nearby water. Once the nest is chosen the female will lay a clutch of between 8 and 13 eggs. After she lays her eggs the male will abandon her. The female will then incubate the eggs for about 4 weeks. During incubation, she will pluck down feathers from her breast to line the nest and cover her eggs. Shortly after hatching the female will lead her down covered chicks to water. Mallard chicks are "precocial", meaning they are born relatively independent and able to swim and feed themselves immediately after birth. Yet, they will stay with there mother for about 8 weeks until they fledge. The male loses most of it's colorful plumage after breeding during it's molting period. They will molt again in the early fall and regain there recognizable breeding colors. Nearly all pet ducks are descendants of the Mallard duck. During incubation, when the female leaves the nest for food, she will hide the eggs using vegetation or down from the nest. The mallard is the only duck the actually "quacks".